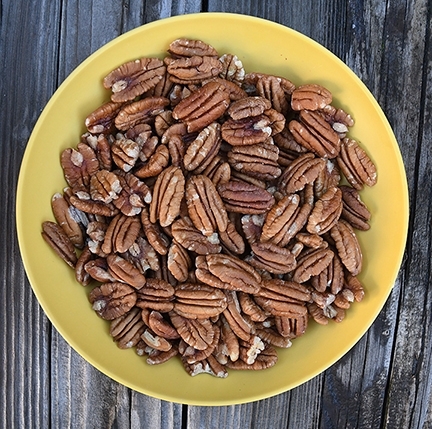 We do love our pecans. The U.S. produces 80 to 95 percent of the world's pecans, and most are grown in Georgia, according to the UC Davis Fruit and Nut Research and Information Center (FNRIC). In 2014, the U.S. produced 133,165 tons of pecans (in-shell) valued at more than $400 million. Of that, California contributed 2,500 tons, valued at a little more than $10 million, or less than 2 percent. “Although pecan trees have existed in California for more than a century, the first commercial orchard in California was established in the mid-1970s in the Clovis area," FNRIC relates on its website. “Since then, pecan production has spread throughout the Central Valley, but it is not nearly as widely cultivated as other nut crops (almond, pistachio and walnut) in California." The nuts thrive on long, hot summers for proper maturation. The pecan (Carya illinoinensis), native to Mexico and the southcentral and southeastern regions of the United States, is a member of the Juglandaceae family, which includes hickory and walnut. "Remains of pecans were found in archaeological excavations in Texas with human artifacts dating back to 6100 B.C.," according to the Nutcracker Museum. 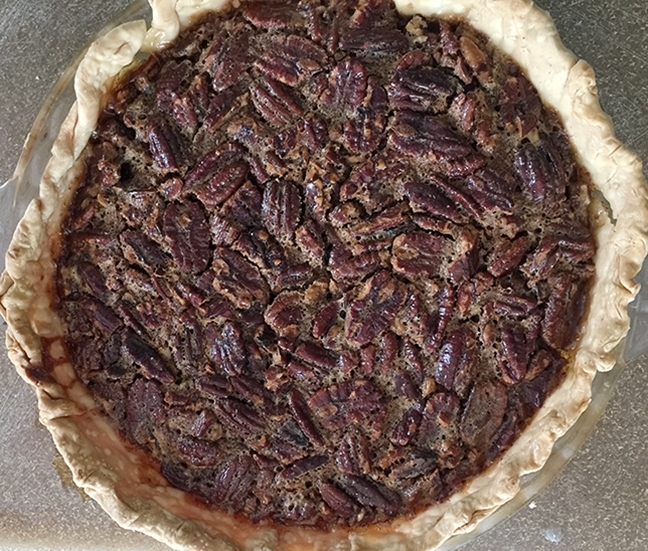 "The pecan, which is native only to North America, was found in or near river beds, and was a staple in the diets of both the natives and the early settlers." Meanwhile, all over the country — especially the South — pecan pie is synonymous with the holidays. It's an iconic Southern cuisine, a 19th century invention, that probably originated in the 1800s. Harper's Bazaar published the first known pecan pie recipe in 1886. Today, cooks clamor to make it their own — adding everything from bourbon to rum to chocolate to orange zest. My late mother, born and reared on a Texas ranch where pecan trees flourished, treasured the pecan pie. She always pronounced it “Peh-CAHN” (never PEE-can) and prefaced it with "rich." Not “rich,” as in wealthy, but rich as in “don't-eat-too-much-of-this-or-you-will-engage-in-a-hate-relationship-with-your-scales.” If you're thin and have to "stand up twice to make a shadow," as the Southern saying goes, then no worries! Did you know that pecan pie is the state dessert of both Texas and Oklahoma? And that the pecan is the "state nut" of Alabama and Arkansas? In Tennessee, it's known as the "state health nut." That's because it is! In the Garvey household, our favorite pecan pie recipe is loaded with nuts — two cups. That's 66 pecans per cup or a total of 132 pecans, says nutritionist Amy Block Joy, who knows how to put the "nuts" in nutrition. We know how to put the pie in the pantry, and then to the holiday table. Preheat oven to 350 degrees. Spread pecans on baking sheet and toast at 350 degrees for 6 to 10 minutes. Set aside. In medium bowl, beat eggs with a fork or wire whisk. Add cornstarch and mix until blended. Add corn syrup, sugar, rum, butter and vanilla. Stir in toasted pecans. Pour mixture into pie crust. Cover outer crust with loosely placed, crimped aluminum foil to prevent excess browning. Bake at 350 degrees for about 50 minutes. At 40 minutes, remove aluminum foil from outer crust and cook for another 10 minutes, or until knife inserted in center comes out clean. The center should be slightly firm to the touch but a bit jiggly. Place pie on wire rack and let cool at room temperature for two hours before serving. In a medium bowl, combine flour, salt and sugar. Cut butter into flour mixture until it resembles coarse crumbs. Gradually sprinkle the water over the dry mixture, stirring until dough comes together enough to form a ball. Wrap dough in plastic wrap and refrigerate for at least one hour. Roll the dough out into a 12- to 13-inch circle. Place in pie plate and let it overhang 1/2-inch. Crimp the crust. Two free publications on nuts have recently been published by ANR — Nuts: Safe Methods for Consumers to Handle, Store, and Enjoy and Nuts: Safe Methods for Home Gardeners to Harvest, Store, and Enjoy. Including nuts in a diet low in saturated fat and cholesterol may help reduce the risk of heart disease. 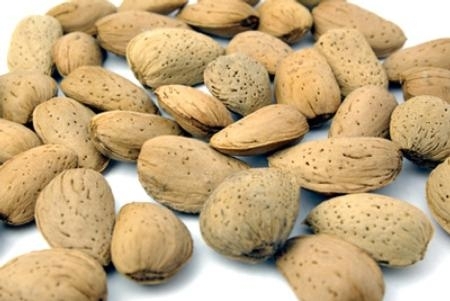 Almonds, pecans, pistachios, and walnuts contribute to health through their protein, dietary fiber and unsaturated fat. The consumer publication includes a handy table outlining optimal freezer and refrigerator storage times for a variety of nuts as well information on nut allergies, nutrition and resources for recipes. Home gardeners with nut trees will find useful information on harvest times and methods, hulling and drying procedures, safe handling procedures, storage, and nutrition information for almonds, chestnuts, pecans, pistachios and walnuts. Inside both publications is a discussion of recent bacterial outbreaks in nuts and the steps producers have taken to minimize the risk of exposure to consumers.